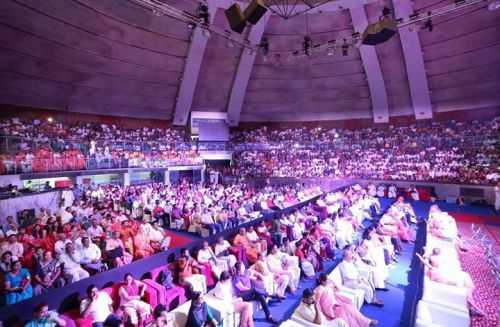 Several thousands attended ISKCON’s Festival of Inspiration to celebrate the 500th Anniversary of Lord Sri Chaitanya. India’s Union Minister for Tourism and Culture Dr Mahesh Sharma inaugurated the event and spoke on how Sri Chaitanya Mahaprabhu’s movement is about devotion and compassion. He thanked ISKCON for taking India’s culture around the world. The festival saw several stunning presentations by national and international artists. These included Odisi Dance on Dasavatar, Shadow Play, Drama on Sri Chaitanya Mahaprabhu. A kirtan team of members from Urugauy, Venuzeual, Uganda, Russia, Spain, India, Mauritius enthralled the audience with their meditative and uplifting kirtans. ISKCON Sannyasis and members spoke on the legacy of Sri Chaitanya and Srila Prabhupada.